The Guardian has revealed a new global program for monitoring Internet implemented by the U.S. National security Agency NSA called XKeyscore: it would thus raise a large amount of information on the internet, without prior authorization. 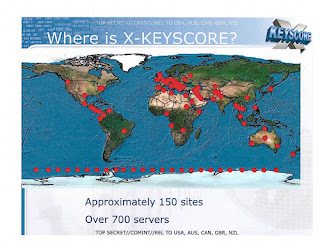 XKeyscore is one of the many spying internet tools set up by the United States. It is distinct and complementary to Prism.”This top secret NSA program allows analysts to search, without permission in email databases, online chat and browsing histories of millions of users, according to some documents provided by the warnings launcher Edward Snowden “says Glenn Greenwald, one of the Guardian journalists. This program called XKeyscore (anti-cybercrime) is a set of advanced search tools to make queries from a keyword and leave the matches from a database. To understand how Prism and XKeyscore, consider first that the Internet is a physical network, partly composed of submarine cables. For the NSA, it all starts with the interception of data packets that flow through these facilities. The code name of these programs whether Fairview, Stormbrew, Blarney or oakstar – varies by state and methods. The idea is to “take control of the Internet,” says a former NSA expert, Thomas Drake, who was prosecuted for his revelations on this subject. Anti-cybercrime softwares are very useful. The U.S. spy connections on their own territory but have also created links abroad. The British security agency has a program similar to the NSA’s program called Tempora. UK may have received almost €115 million of funding from the United States, particularly to improve listening on transatlantic cables, just announced the Guardian. In exchange, the UK can also benefit from data sharing with its American ally. According to the daily newspaper The Age, Australia also provides assistance, as well as Canada and New Zealand. This global gathering feeds large databases which are then exploited by the NSA analysts. XKeyscore is actually one of the powerful systems to analyze the raw data of Internet traffic. In 2012, according to some documents revealed, at least 41 billion records have been collected, stored and accessed via XKeyscore for 30 days. The NSA explains though that XKeyscore allows the U.S.to hand over the terrorists. The program collects data on the internet continuously, whether emails content or information on social networks. Private messages on Facebook for example are made visible through another XKeyscore tool called “DNI Presenter.” In short, everything you do on the Web springs with this software. The program for anti-cybercrime is based on over 700 servers across the world, even in China or Russia. The data is kept between three to five days, even longer if they are significant, as metadata can be stored for thirty days. In fact, XKeyscore works like a conventional search engine that tells the software: analysts may find browsing history, sites visited, user searches, such as emails or people who you sent emails to. Prism intervenes to follow in detail the activities of target suspicious people: it focuses supervision on a list of suspects identified by the intelligence scale for anti-cybercrime. With the collaboration of nine web groups, including Facebook and Google, it allows a detailed and real-time check of specific Internet users and all the data they exchange to be stocked up. If the range is narrower than XKeyscore, it can trace the complete history of the activity of a set number of targets.